Trigger Warning (TW): This post contains content that may be triggering for some readers. The scene: I’m riding in the passenger side of my boyfriend’s Lexus. The sun has gone down. He says it’s time for him to go home. Going home meant he would be leaving me and spending the night with his wife. Although I believed his marriage was in shambles, as was mine, which was one of the motivating factors that caused us to seek refuge in each other’s arms, I couldn’t bear the thought of it and wanted him to spend the night with me. Nothing I said could convince him. That’s when I pulled out the heavy duty stuff: In what was my typical “borderline fashion” at the time, I threatened to kill myself. I told him how I would do it. As is common for many people with Borderline Personality Disorder, I frequently threatened to hurt myself. I didn’t always really feel suicidal. I often just felt so desperate and out of control emotionally that it was the only way I’d learned how to reach out for help and get myself to a place where I felt safe and where people would have to take care of me: the hospital. In our three month young relationship, he was no stranger to my emotional instability and frequent visits to the hospital for psychiatric treatment. He insisted that we needed to go to the emergency room. In the midst of my dysfunction and with a one-track mind, my only thought was: I just bought myself a few more hours with him. I had it all planned — I knew what to say so that the hospital would release me within a few hours. It would be late, and he’d spend the night with me after all. I was manipulative and acted in desperate ways to get my needs met. 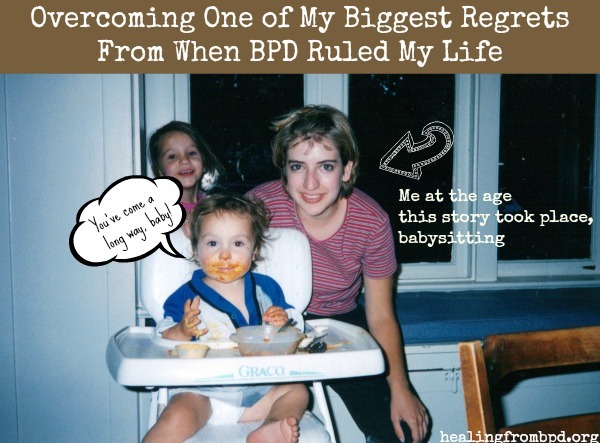 I didn’t know any better, but I’ve been harboring resentment and anger at that part of me — that twenty three year old girl who didn’t have years of treatment and DBT Skills under her belt — I hadn’t yet been formally diagnosed with Borderline Personality Disorder but had “Rule out BPD” on my discharge papers at a psych hospital a few years prior. I never followed up. So, there we were in the ER. When the doctors pulled me aside to speak privately, I told them that I had expressed thoughts of harming myself but had no intentions to carry them out. When I returned to the room with my boyfriend, him sitting up on a table, observing me and seeming concerned, what I didn’t know is that the room was likely being monitored, and in that room, I sabotaged that relationship and behaved in ways that would haunt me for over a decade. When he said he needed to get going and to call him in the morning from wherever they sent me, my desperation went into overdrive. And that’s when I began to tell him I was hearing voices. (It wasn’t true.) I began speaking nonsensically. When hospital staff would enter the room, I’d return to acting normally. I convinced my boyfriend that I was schizophrenic or somehow even more severely emotionally ill than what I really was. His eyes misted up. He looked at me and said, “I LOVED you.” Yes, past tense. Shortly after that, he broke up with me, conveying that he didn’t have the strength or desire to continue on and that he couldn’t handle my mental illness. I knew I had pushed things too far. In an attempt to secure his love and keep him by my side, I did the exact opposite and pushed him away so far that I lost him. There was nothing I could do to convince him, even though I was released from the psych ward in less than 24 hours, having told the staff and psychiatrist the truth about what had happened. I loved this man. He rescued me from a depressing, abusive marriage with a substance abuser, and I rescued him from his marital problems. We expressed that we believed we were soul mates. We could see forever in each other’s eyes we would say. I felt alive, beautiful, and wanted in his company. During our relationship, I wrote three pop folk songs on my guitar and haven’t written any songs since. When I received the ultimate rejection from him, the pain was so great to bear. I ended up going back to my husband one more time before finally leaving him. A lot has happened in the years since the last time I saw my boyfriend. As I mentioned, I was twenty three years old at the time, and he was thirty seven. We worked together. So, when we broke up, I also left my job. And, I bad mouthed him badly before I did. I was immature, emotional, unstable, and desperately wished that things were not dissolving with him. But he made a choice, and I could not convince him otherwise. I tried to use anger to cope with the pain. I was smoking about two packs of cigarettes a day, and my diet was also suffering. Over the years, the pain dissipated. I met other people. I had jobs. I went to school. I moved on. Then, recently, due to some changes in my life, memories and feelings resurfaced for this person. Being that we live in the internet age, finding ways to contact him were quite easy. I became disheartened and my heart re-broken as he stood fast in resisting, completely, replying to me. Rather than listen to my Wise Mind 100% of the time, I continued to try to reach him, feeling the rejection and sadness each time I realized that this person does not want to re-connect with me. I essentially re-opened the wounds of trauma from that time in my life. I was losing self-respect while also working my DBT (Dialectical Behavior Therapy) skills around the clock: Turning the Mind (toward Radical Acceptance), distracting, self-soothing, contributing. But I kept finding myself back at the computer or looking at my phone to see if I had a response or if he had viewed my messages. I began judging myself harshly, knowing that while there is cause for everything, I needed to make a shift, get to the core of the reason why I was so fixated on re-connecting — I wanted redemption. I wanted the opportunity to look into his eyes and to try to convince him of what happened in that hospital room that night…and that I’d changed. I wanted him to know how sorry I was for sabotaging our relationship and how far I had come since then. But this was not an option, and accepting this caused me incredible pain and left me feeling quite emotionally dysregulated. Because hypnosis has been highly effective in helping me making positive shifts when I have felt stuck or as if I were having a mental “block,” I turned to my hypnotherapist to do some work around this issue. During our session, one of the things she proposed intrigued me, and I was nervous but excited to try it. She suggested that, while in trance, I would go back to that scene at the hospital that has haunted me for years. The scene would be on “freeze frame,” and my adult self now would visit with the 23 year old me and my boyfriend of the time in that room. I would tell my younger self what was about to happen — warn and prepare her. I would tell her that I couldn’t prevent what was about to happen, but I could let her know what kind of amazing things she had ahead of her (overcoming a mental illness to the point of no longer meeting the criteria, writing 2 successful books, being in a documentary about BPD, co-facilitating DBT classes with a therapist — I’d even be able to help other twenty-somethings by mentoring them after I was to heal from this experience with this man). So, I did it. In trance, I vividly re-experienced the scene in the emergency room that night. (When I came out of trance, my eyes were nearly glued shut from all of the crying and my mascara.) I had the opportunity to go back and be there for that scared girl who didn’t know any better. My heart grew in compassion, and my judgments were melting. I told her she didn’t know any better because she didn’t have the skills to cope any more effectively and that she was doing the best she could. I also encouraged her to release the man in the room, because she was worth so much more than what she had settled for, and some day she would have it. I also looked at my ex-boyfriend from my current age, seeing him with compassion — knowing he was a man with his own story, fears, and hopes. I judged him a bit for being with a twenty three year old girl, and then I let that go, too. I told my younger self everything she had to look forward to. It helped substantially. There was another scene my hypnotherapist suggested we do as well, which was a meeting with my ex where I got to express everything I have been so wishing that he would allow me to say to his face. She likened my sadness around not having this opportunity to what many addicts in AA and NA experience when they attempt to perform the step where they “make amends” with someone from the past. Not everyone is willing. Sometimes people are unwilling or for whatever reason, unavailable. The person in AA/NA must do the work to accept this and move on, no matter how badly it hurts. After I did this part of the exercise, I felt a real release — as if an imaginary umbilical cord of some sort had finally been severed between me, this man, the past, my delusions about the past, my fond memories of it, and any hopes and wishes about how I wish things had turned out differently. While I work with people of all ages all around the world in the capacity of encouraging them through posts here, my books, and now in the online DBT classes that I co-facilitate at DBT Path, my heart is especially drawn to young women in their early twenties who are struggling with the symptoms of Borderline Personality Disorder — especially the intense and chaotic relationships, fears of abandonment, and identity issues. I needed to come to a place of healing, love, and forgiveness with my younger self so that I could truly heal and be available to help young women who are where I was — to encourage them and hopefully help them reduce their suffering through the wisdom that my older self has gained. Part of this is sharing vulnerable experiences so that you know you are NOT alone, and that you, too, can overcome. I will also be sticking with my skills and using other modalities, such as hypnotherapy, to support me in my ongoing recovery and personal growth. This was a long one. It’s been a powerful day. The author of this letter has since RECOVERED from Borderline Personality Disorder and no longer meets the criteria for a BPD diagnosis. There is HOPE for you. Recovery happened through a commitment to DBT. Debbie now teaches the DBT skills that helped change her life over at DBT Path (http://www.emotionallysensitive.com) where you can take online Dialectical Behavior Therapy Classes from anywhere in the world. You *can* overcome this disorder! Visit DBT Path to learn more. What a wonderful and vulnerable piece. I especially liked the part where you were able to speak to your younger self with compassion as well as to him with compassion- something I think a lot people find difficult. As a therapist I often have clients create a relationship journal where they take 1 page and write everyone they have ever had a relationship with (romantic, friendship, family, etc.) In it they write his/her name on the top and a brief paragraph explaining the relationship. They then answer 2 questions: What did this relationship teach me about men/family/boyfriends/etc (looking for themes/patterns/core beliefs?) and What did this relationship teach me about myself? I didn't mean for the response to get this long, just really enjoyed this post a lot! Wow! Very, very powerful piece! I am so glad that you're helping young women with BPD to get the help and encouragement they need, so that they don't have to go through what you've been through. I hope I can be half as good with my site as well. You are such an inspiration, Debbie! I am a 41 y.o. recently diagnosed BPD. I have PTSD, depression, anxiety. This post really hit home. BPD explains everything in me. I am starting my second course of DBT classes next wk. This is wonderful to read and yet at the same time I am writing a letter to my former husbands new girlfriend to tell her of our relationship. Yes we are seeing each other as hurtful as it is to me. I KNOW he will not take me back but there is a part of me that wants him to hurt as much as he has hurt me in the past. It will only get him mad at me, but at this point oh well. Thank you Mary. These things are so difficult and complicated. I wish you and those involved the best. I'm a guy with BPD. My ex was also married. It's been a year and I'm still not over. I made the only person who really loved me, completely cut me off with no warning. Even with my thwrapy, I can't deal with these anymore..
your story is wonderful to behold, but you are not a borderline. Borderlines never regret, because they cant, they have no conscience. Its all fun and games at the end of the day. I have studied them for 8 years. Because I loved one, I came to know what evil was. A borderline will slide a blade slowly between your ribs while they look into your eyes, as you bleed your life away, all life leaves their eyes, and in a voice with no recognition left in it for you, they say, " its nothing personal, its just business." You are not a borderline, borderlines are never sorry they hurt you. Its just not possible for them to say, "I'm sorry, it was me, not you.". 5 Symptoms That Are Often Confused With Borderline Personality Disorder (BPD)... New BPD Documentary: Behind The Scenes Sneak Peek!